If you sat out the SXSW Interactive Festival, this special episode, recorded at SXSW in Austin features Twitter founder Evan Williams announcing the new app platform @anywhere and Mashable Editor-in-Chief Adam Ostrow discussing the latest location-based social networking news, changes at Digg and what's coming for Google Buzz. 00:52 -- A summary of the news from this year's conference, including Twitter's @anywhere announcement, the rivalry between location-based social networking start-ups Foursquare and Gowalla, big changes in store for Digg.com and Google Buzz in the aftermath of the controversy surrounding their decision to integrate their new social network, a public facing system, with Gmail, a system that has always been very private. 01:31 -- At the Diggnation party, Digg CEO Jay Allison unveiled new.digg.com, a new alpha site available through invitation only, which expands trending news stories beyond just digs to include tweaks, Facebook status updates, personal preferences and your social graph. Mashable Editor Adam Ostrow calls it Digg's attempt to become the ultimate aggregator. 02:20 -- Google Buzz is in a tough position given the public and the media's reaction to their launch, but Adam has confidence that they will ultimately be able to overcome those initial missteps. He thinks Google Buzz will be a lot more exciting when they launch an official API so that third-party applications that already integrate with Twitter and Facebook will be available on the service. " I think the product might have been released a little too early in Gmail. I think there were a lot more things they maybe should have considered before launching it," says Adam Ostrow. But he also says don't count them out. Google has more than 20 employees devoted to developing their Buzz product. "It's clearly a very high-priority projects there," he says. 03:11 -- On the target market for Google Buzz, Adam Ostrow says, "The way they explained it to me, not dissimilar to Twitter and Facebook, they're really looking at both consumers and brands. Right now, I think there's a lot of issues that really make it prohibitive for brands and news organizations to really use the tool effectively. I think first off, it needs to be a standalone site, not just Gmail, which is in the works. So you'll be able to use it if you're a Hotmail user, a Yahoo user or whatever. But I also think they have some namespace issues. I think, obviously, if you've had your Gmail account for four or five years and your username might not be your business organization name, it's a very tough to transition accounts. So there's some issues they need to overcome. We've been using buzz pretty heavily at Mashable and I think it has the potential as a tool for brands and media organizations but they have a lot of work to do to get there." 04:07 -- In terms of hot new products this year at SXSW, Adam Ostrow says this year it's all about Foursquare and location-based social networking. But he thinks the imminent arrival of UK-based Spotify in the US market could make it a hot product at next year's SXSW. 06:01 -- A discussion of the panel session titled "How Not to be a Douche Bag at SXSW" featuring blogger Violet Blue who used "PR people" as stereotypical examples of how not to behave at this conference. According to Adam Ostrow, the key to not being a "PR douche bag" is simply being respectful of other people's time and, obviously, knowing who you're talking to and what they cover. Bue Ostrow has a positive attitude towards public relations. "PR people are important to what we do. They do provide us, sometimes, with relevant stories and people we need to talk to," says Adam Ostrow. 08:45 -- Eric Schwartzman tells Adam Ostrow about Jeremy Pepper's blog post entitled "I Don't Do SXSWi," recaps the conference highlights for him which includes Chris Messina's presentation about why activity streams need to evolve beyond the Facebook newsfeed, Danah Boyd's keynote on dealing with privacy in online spaces that are public, Joi Ito's talk about advocating intergovernmental information sharing and Kaiser Kuo's update on the trials and tribulations of Google in China. Eric asks for Adam's opinion as to how he derives tangible business value from a professional conference that is seen by many as nothing more than a debauchery fest. 09:48 -- Adam Ostrow uses SXSW mostly as an opportunity to cement relationships initiated online in the physical world. "I love to get that face time and really know who they are," says Adam Ostrow, who benefits from the personal relationships he develops at SXSW through as yet unknown story opportunities and potential business development deals. "For people in social media and the consumer facing web, it's the best place" to network. 11:09 -- The Mashable party at SXSW was intentionally designed to afford attendees the opportunity to network and party at the same time. The split level venue was divided into a section with a live bands and another section for networking. 12:51 -- Through a joint venture, Mashable is currently writing "B2B" content for American Express's OpenForum.com. They create similar coverage to what runs on Mashable.com, but for a small business community, primarily about how they can use social media to market to their customers, which may be other businesses, or which may be consumers. 13:06 -- When it comes to B2B applications of social media, how you set your organization's presence up online, how you respond to customers and devoting adequate resources to listening is key. "That's the point of being there. You can be there and just broadcast company news, and I don't think that's too interesting. It's a way for people to keep up with you. But the way we use it as a brand, and the way small businesses we like are using it, is to interact" with customers says Adam Ostrow. 14:50 -- Evan Williams announcing their new app platform @anywhere for integrating Twitter into websites. @anywhere will allow website visitors to follow Twitter users from any website. Hovering your cursor over a Twitter ID on any website using @anywhere will reveal a pop-up window that allows you to follow that account in just two clicks. You can also control how receive information from Twitter wihtout every going to Twitter.com or a Twitter client. @anywhere can also be used to allow Twitter users to use their Twitter account to sign in to a website. Thirteen different websites have been selected to beta @anywhere, including Amazon, Ebay, Yahoo, Bing, YouTube, The New York Times, Digg, Salesforce.com and others. 16:30 -- "The main thing that @anywhere does is reduce friction," says Twitter founder Evan Williams, who admits he's not sure how developers will ultimately wind up using the new technology. One of the more obvious features include the ability to tweet links directly from a participating website. But a bigger advance is the ability to follow a Twitter account directly from a website, instead of having to click through to Twitter.com and log in if necessary to follow the account. Discovery is one of the hardest challenges because of the sheer volume of content that's out there. So putting the ability to follow in the context of the individual or organization your following reduces some of the friction that's currently present in discovery. 17:47 -- The benefits of @anywhere to website operators is a connection to users that you didn't necessarily have before and a way to keep them coming back. "We hear from sites all the time that Twitter drives them tons of traffic. It should result in more followers for a site just sending out links. It should also probably result in more people who are your fans, who are your audience using Twitter, talking amongst themselves and talking about your content, so hopefully it becomes a richer experience. 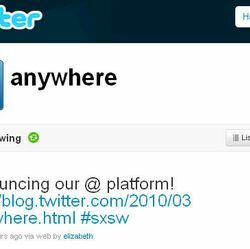 18:54 -- @anywhere also brings user tweets into your site and gives the ability to create a whole community or sub community in your own site. The goal of Twitter is to help people and organizations build stronger relationships, and @anywhere is about lowering the barriers to achieving that. The keynote interview was conducted by Umair Haque, director of Havas Media Lab.